In its 1,000-plus-year history, the Yiddish language has been called many things, including the tender name mameloshen (mother tongue), the adversarial moniker zhargon (jargon) and the more matter-of-fact Judeo-German. Literally speaking, Yiddish means “Jewish.” Linguistically, it refers to the language spoken by Ashkenazi Jews — Jews from Central and Eastern Europe, and their descendants. Though its basic vocabulary and grammar are derived from medieval West German, Yiddish integrates many languages including German, Hebrew, Aramaic and various Slavic and Romance languages. It is impossible to pin down exactly where or when Yiddish emerged, but the most widely-accepted theory is that the language came into formation in the 10th century, when Jews from France and Italy began to migrate to the German Rhine Valley. There, they combined the languages they brought with them, together with their new neighbors’ Germanic, producing the earliest form of Yiddish. As Jews continued to migrate eastward –a result of the Crusades and the Black Plague–Yiddish spread across Central and Eastern Europe and began to include more elements from Slavic languages. In Ashkenazi societies, Hebrew was the language of the Bible and prayer, Aramaic was the language of learning and Yiddish was the language of everyday life. Scholars refer to this as the internal trilingualism of Ashkenaz. Though they vary in sound and use, all three languages are written in the same alphabet. The first record of a printed Yiddish sentence is a blessing found in the Worms Mahzor (Vórmser mákhzer) from 1272. Beginning in the 14th century Yiddish was commonly used for epic poems such as the Shmuel-bukh, which reworks the biblical story of the prophet Samuel into a European knightly romance. Yiddish publishing became widespread in the 1540s, nearly a century after the invention of the printing press. To ensure the broadest possible readership, books were published in a generic, accessible Yiddish, without the characteristics of any particular Yiddish dialect. In the 1590s, the Tsene-rene (also called Tzenah Urenah) was published for the first time (eventually, more than 200 editions were printed). The book, which retells the weekly Torah portions woven together with homiletic and moralistic material, became known as “the women’s Bible,” because it was read in particular by women on the Sabbath and holidays. By the 18th century, German-speaking Jews were quickly acculturating. In Western Europe, leaders of the Haskalah (the Jewish Enlightenment) campaigned heavily for the use of German over Yiddish, which they referred to as “barbaric jargon.” At the same time, Yiddish was flourishing in Eastern Europe, where compact settlement helped the number of speakers reach the millions by the 19th century. The rise of the Hasidic movement also did much to further Yiddish along — in both numbers of speakers and spiritual prestige. Two of the key early works of Hasidism were written in both Yiddish and Hebrew: Shivkhey ha-Besht (Praises of the Besht), which were stories about the Ba’al Shem Tov, and Sipurey Mayses (Telling of the Tales), a collection of stories from the Ba’al Shem Tov’s great-grandson Nahman of Breslov. The late 19th century saw the birth of modern Yiddish literature. The “grandfather” of this new literary movement was Sholem Yankev Abramovitsh, known by his pen name Mendele Mokher Seforim (Mendele the Bookseller). I. L. Peretz, a Polish writer, poet, essayist, and dramatist became known as the “father” and humorist Sholem Aleichem, born in Ukraine, the “grandson.” The realism, irreverence, satire and moralism found in the works of these three writers heavily influenced the development of Yiddish literature. In 1908, the first international conference on Yiddish language (the Czernowitz conference) declared Yiddish to be “a national language of the Jewish people.” The purpose of the conference was to discuss all the issues facing the language at that time, including the need to establish Yiddish schools, to fund Yiddish cultural institutions and to establish standard Yiddish spelling. However, these agenda items received little attention, with much of the debate being focused on whether Yiddish should be considered the national language or a national language of the Jewish people. In 1925, YIVO, the Yiddish Scientific Institute, was founded in Vilna. It became the premiere institution for Yiddish scholarship and has been based in New York since 1940. In the early days of the Soviet Union (1922 until the mid-1930s), the communist government supported Yiddish schools, theater, research and literature — as long as these were strictly cultural expressions without Jewish religious content. The extraordinary support given to Yiddish, and the respect initially shown to Yiddish writers, led many around the world to see the Soviet project as the true hope for the future of the language. However, the government soon began to censor Yiddish works, and eventually closed down most Yiddish institutions. During the purges of 1937, many Yiddish writers and leaders were arrested and executed at the increasingly paranoid orders of Joseph Stalin, who viewed Yiddish as anti-Soviet. In 1952, the remaining great Yiddish writers in the Soviet Union were brutally murdered in what is known today as the Night of the Murdered Poets (though not all of those executed were writers). In pre-state Israel (1918-1948), and later in Israel, Yiddish was marginalized and, in some instances, outlawed. Until 1951, it was illegal for local theater groups to stage productions in Yiddish. Hebrew was the national language of the Jews in their land, and was considered the only legitimate medium of Jewish expression. 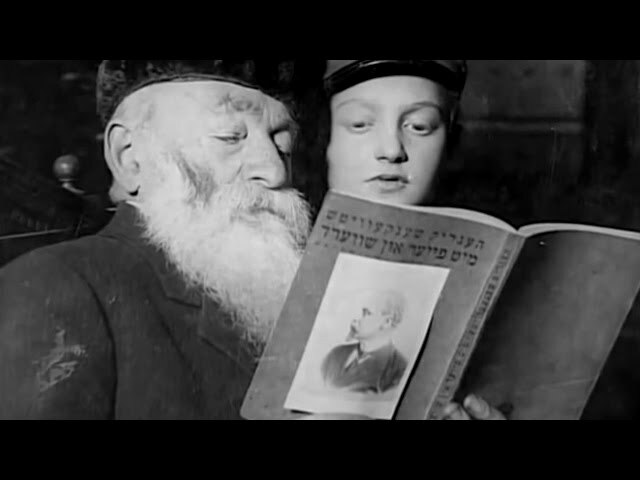 On the eve of World War II, there were roughly 13 million Yiddish speakers in the world. The Holocaust destroyed most of this population. In America after the war, immigrant parents were often hesitant to speak Yiddish with their children. Though there were a few networks of Yiddish schools in the post-war period, after-school programs and camps could not compete with the intense pressures of Americanization. Yiddish began to take on a lowbrow image, and its use was associated with failure to climb up the American socioeconomic ladder of success. But the last half century brought many positive developments for Yiddish. It has been seriously studied as an academic discipline, and Yiddish literature has been recognized as great world literature, exemplified by Isaac Bashevis Singer receiving the Nobel Prize for Literature in 1978. The 1970s saw the beginning of a Yiddish and Eastern European cultural revival, particularly in music. Thanks to the work of highly-talented artists, at the forefront of which are groups like The Klezmatics, klezmer music is now a ubiquitous presence in American Jewish culture. Quiz: Which Yiddish Word Are You? Produced in Poland and America, Yiddish film captured the diversity and richness of the Yiddish-speaking world.